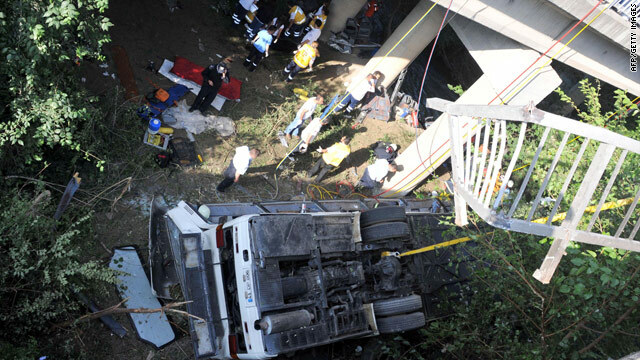 Rescuers work near the wreckage of a bus that plunged off a bridge in Turkey's Antalya province. Istanbul, Turkey(CNN) -- A bus crashed off a bridge and plunged into a river in Turkey's Mediterranean province of Antalya on Tuesday, killing at least 15 Russian tourists and wounding 24 others, officials said. "It could be that the bus driver fell asleep or that he passed a car the wrong way," said an official from the Aksu district governor's office. "They (the victims) have all been transferred to various hospitals around Antalya. And we were told that the passengers were all Russian." The bus was traveling along Turkey's Mediterranean coast, a popular tourist destination for hundreds of thousands of Russian tourists. It landed on its roof after the crash.